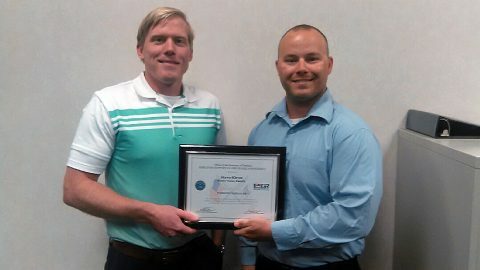 Shawn Kleven, inventory planning supervisor at Border States Electric (BSE) was honored with the Patriot Award September 15 for being an outstanding supervisor to a member of the armed forces. The North Dakota Committee for Employer Support of the Guard and Reserve gives the Patriot Award to outstanding and supportive employers who work with veterans and support their choices to take on additional duties of serving the nation. Kleven was nominated for the award by First Lieutenant Bryce Johnson, who serves with the Army National Guard. Johnson is a purchasing specialist at BSE. This is not the first award BSE has received for their support of the Guard and Reserve. BSE was a semifinalist in 2014 for the Freedom Award. In 2013, three BSE employee-owners received the Patriot Award, and BSE as a whole received the Above and Beyond Award. At that time, Tammy Miller, CEO, signed a Corporate Level Statement of Support as a confirmation of BSE’s commitment to their employee-owners who serve in the military. 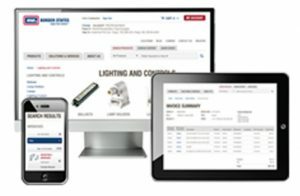 BSE supplies products and services to construction, industrial and utility customers. The 100 percent employee-owned company is the eighth largest electrical distributor in the U.S. as ranked by Electrical Wholesaling magazine. BSE has more than 2,200 employees and 95 branches in 18 states. Corporate headquarters are located in Fargo, N.D.